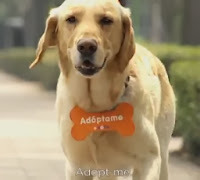 Fantastic Campaign - Adopt a homeless Dog - Motivate Amaze Be GREAT: The Motivation and Inspiration for Self-Improvement you need! This is a fantastic creative campaign created by Y & R for +Kota Pet Store in México. It advertises for the adoption of dog in a unique way. How great and funny is this? Look at the end results, fantastic! Enjoy it.